Sense of place: Las Balsas in Patagonia. More than a century ago, Cesar Ritz and Auguste Escoffier made it clear: a great hotel needs a great restaurant. Over the years, however, the definition of hotel dining has expanded. For every formal dining room, there's now a breezy meal on the terrace, or even a snack of crispy fried insects. So what makes a hotel restaurant great? More than just sublime food, it should offer a sense of place, plus an X-factor that sets it apart. Here is a selection of places where dinner is a destination. Cool and class collide at this hip eatery, which has been virtually booked out since it opened last year. Each of the restaurant's separate spaces has its own vibe, from the buzzy Atrium to the cosily opulent Parlour and the romantic Fireplace. The menu has the finesse you'd expect of chef Daniel Humm and restaurateur Will Guidara, the team behind the revered Eleven Madison Park restaurant. There's enough foie gras and truffles to suit the expense-account diner, while more inventive vegetable-based dishes showcase Humm's modern approach. For a perfect night out, grab a seat in the Parlour (mood lighting that still lets you read the menu - respect!) and start with a salad of fresh, sweet young brussel sprouts done three ways - steamed, shredded and fried leaves -with accents of hazelnuts, apple and lemon. 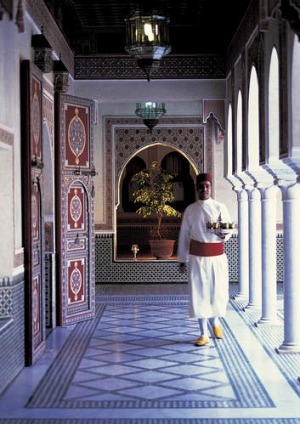 La Mamounia Hotel's Le Marocain. That should leave enough room for the show-stopper roast chicken for two, done with foie gras, black truffle and brioche: worth every cent of the $79 price tag. Few things are what they seem at Dinner by Heston Blumenthal, the celebrity chef's outlet in London's Mandarin-Oriental Hotel. Those light fittings? They are actually jelly moulds. That mandarin?It's made of foie gras. This a wonderland of a restaurant, with an inventive menu and superb service. From the warm welcome when you arrive, to the meal's grand finale, ice-cream made at your table, the experience is seamless. More than any other hotel group, Mandarin-Oriental has perfected the art of destination dining. With Dinner by Heston Blumenthal, they have trumped themselves. It's a rare hotel where you feel comfortable popping into the kitchen in the morning to ask for a coffee, but then, staying at Whare Kea Lodge feels more like staying with super-wealthy friends. Which is what you are doing, sort of: the six-bedroom lodge was once the Myer family holiday home and has retained that laidback vibe. Meals are served at a communal table and feature whatever chef James Stapley feels like serving up. That could include delicious Bluff oysters, a salad of West Coast crayfish and homegrown heirloom tomatoes, wild Fiordland venison, or the bite-size beignets. Best of all, Stapley likes to please: following our raptures over the beignets served for dessert, he whips us up another batch the next morning. Some chefs think they know everything. Rachid Agouray is not one of them. When he was asked to add a contemporary twist to the classic Moroccan dishes for which La Mamounia's Le Marocain restaurant was famous, he turned to the experts: local women. It's the women who keep Morocco's culinary traditions and his team of specially recruited females has created some of Morocco's most interesting cuisine. Whether it's a phyllo cigar stuffed with chicken or a reinvented pastilla, the traditional pigeon replaced with lobster and salmon, the dishes are a delight. Throw in a torch-lit terrace, carved cedar screens, tinkling fountains and the scent of jasmine - and it's an Arabian night. You don't have to eat the bamboo worms if you don't want to, but you'll be missing out if you don't. Bamboo worms don't feature on most Chinese menus but Xishuangbanna is a very particular pocket of China. 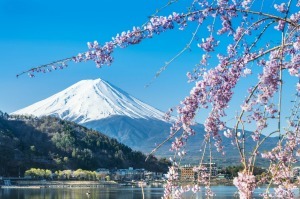 It's the Chinese equivalent of the wild west, closer to Thailand than to cities such as Shanghai and Bangkok, and known for its vast rainforests, wild elephants and majestic centuries-old tea trees. Top marks to the hotel for showcasing the cuisine of the local Dai tribespeople, full of fresh herbs and indigenous specialties such as ganba (air-dried beef), river snails, river weed, and rice dishes cooked in bamboo. And the bamboo worms? The local equivalent of crisps, flash fried and perfect for munching on as you pull on a beer. Ganbei! Here are some reasons why we love La Cuisine, one of two Michelin-starred restaurants in this Parisian pleasure palace. There's the decor: a funky updating of the traditional grand restaurant that is not in the slightest stuffy. There's the attentive service, in which no detail is neglected: order steak, and you will be invited to choose from a selection of nine knives, each with its own history. There's the menu, which offers both traditional and innovative approaches. Atlantic cod, for instance, comes as both a traditional confit option, or an Asian-influenced version with braised black rice, honey, ginger and lemon. Just be sure not to peak too early: once the cheese sommelier has had his way, you'll still need room for the made-to-order Pierre Herme millefeuilles combinations such as fig and foie gras. How did a small spa village in the Black Forest, home to just 8000 people, come to score eight Michelin stars? Largely through the rivalry between the town's two largest hotels, Hotel Traube Tonbach and Hotel Bareiss. Both hotels invested heavily in their restaurants and both can boast three-Michelin-star restaurants but only the Traube Tonbach has chef Harald Wohlfahrt. Wohlfahrt is culinary royalty. Not only has he held three stars for more than 20 years, he also trained most of Germany's other three-star chefs himself. All that and he still finds ways to weave new flavours and textures into his dishes, such as a delicate char served with kataifi and a salad of carrot, coriander, ras al hanut and caraway seeds. With food this good, it's hard to restrain yourself - but you can always burn it off afterwards with a walk in the Black Forest. 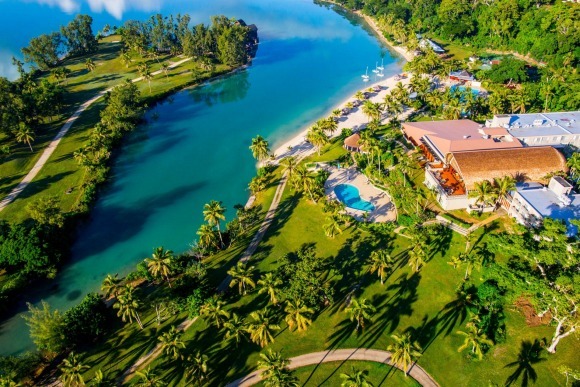 If you appreciate the perfection of an exquisitely decorated petit four, or a single scallop perched carefully on a porcelain spoon, you're going to love Las Balsas, a small but perfectly formed hotel with an equally enchanting restaurant. 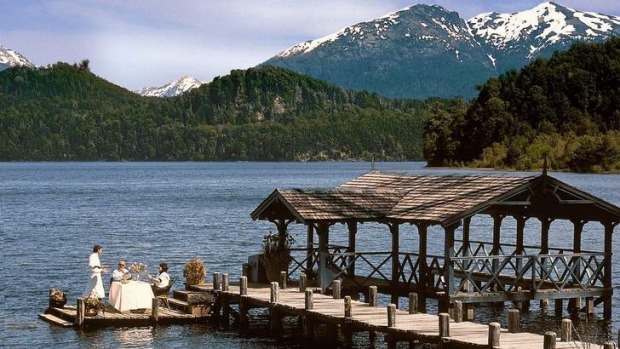 The setting alone is enough to conjure superlatives - a shoreside location on Lake Nahuel Huapi, the prettiest mountain-fringed lake in northern Patagonia - but Lucas Dabrowski's way with local ingredients is just as impressive. A crab strudel with squid ink and apple is wonderfully light, with a perfect blend of flavours; but Dabrowski's real genius lies in reinventing favourites such as roast chicken, here served with sun-dried tomato, black olives, toasted almonds and potato and cheese fondue. Throw in an impressive wine cellar showcasing Argentina's extraordinary wines, and you have a real little gem. Sometimes, dinner at the hotel restaurant is the easy option. When you're too tired and hungry to go elsewhere, you end up sitting in a corner table, reading your book or your iPad while you eat. 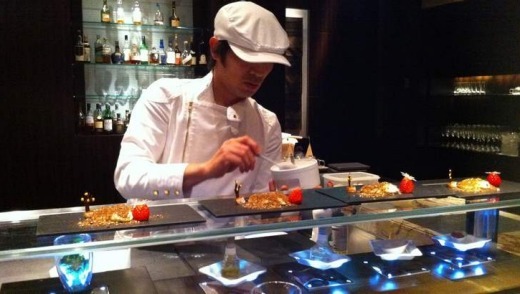 At Tokyo's Mandarin-Oriental hotel, they have an antidote for this kind of meal: the Tapas Molecular Bar. Two chefs, two nightly sittings, eight diners, 16 courses, plenty of molecular flimflammery, including dragon imitations using liquid nitrogen: it's a night out that turns strangers into participants in a culinary adventure. The food is exquisite, each themed plate showcasing a different set of ingredients. The pretty Underwater Forest, for instance, highlights delicately briny flavours such as Okinawa seaweed, kombu seaweed broth and sea urchin. The UK has no end of country houses with fine food, but few do it as well as Raymond Blanc at Le Manoir aux Quat' Saisons. The Fasano family understand food - and branding. Before they opened the Hotel Fasano in Sao Paulo, they ran the city's biggest restaurant empire. Naturally their hotel restaurant - again called Fasano - is one of the best in town. Basque chef Martin Berasategui has brought his creative cuisine to Barcelona's Condes de Barcelona hotel, highlighting quality ingredients such as smoked eel and woodpigeon. Some might call this cheating - Michel Bras' eponymous triple Michelin star restaurant came first, the attached rooms followed. But we love the place so much we're including it anyway. There's plenty of southern comfort on offer at Tennessee's Blackberry Farm but the real reason people flock here is dinner in the atmospheric barn.